Fly Me To The Moon at World Square is a project that brings Sydney together to cycle the 384,400 km distance to the moon. Apollo 11 at Barangaroo is a series of supersized astronaut sculptures featuring fascinating facts about the lesser known, diverse heroes of space exploration. Moon Drops at Darling Harbour is an interactive installation of big bouncy droplets you can jump on to experience weightlessness on Earth. If you’re as enthralled by moon landing lore as we are, then you might be interested in the collection of strange, hilarious and little-known facts about the 1969 moon landing below. Seriously. The International Latex Corporation (ILC), which you might know for its current brassiere brand name Playtex, submitted the winning design for the Apollo 11 spacesuits. It’s an epic story that involves ILC winning the contract, then losing it, then ex-employees of ILC breaking into their old offices to steal their original designs back. You can read the whole story over at Wired. ILC still supplies NASA with space equipment, including the airbags that allowed the two Mars rovers to land safely. Sadly, Sydney Festival isn’t the first to try and get a bike to the moon (metaphorically, that is, for our Fly Me To The Moon project) – NASA actually prototyped a ‘lunar motorbike’ as a potential mode of transportation on the moon. The idea was ditched in favour of the iconic moon buggy, or Lunar Roving Vehicle, but the idea of doing max doughies on the moon remains one of the finest mental images ever. See photos of the prototype bike and read more at Jalopnik. According to the Astronotes blog, published by an Irish observatory and planetarium, the three astronauts on the Apollo 11 mission couldn’t afford the premiums for their life insurance policies. So Armstrong, Aldrin and Collins came up with a rather ingenious plan to provide for their families in the event that the mission turned fatal – they signed hundreds of autographs and entrusted them to a friend to sell off in case they didn’t make it back. 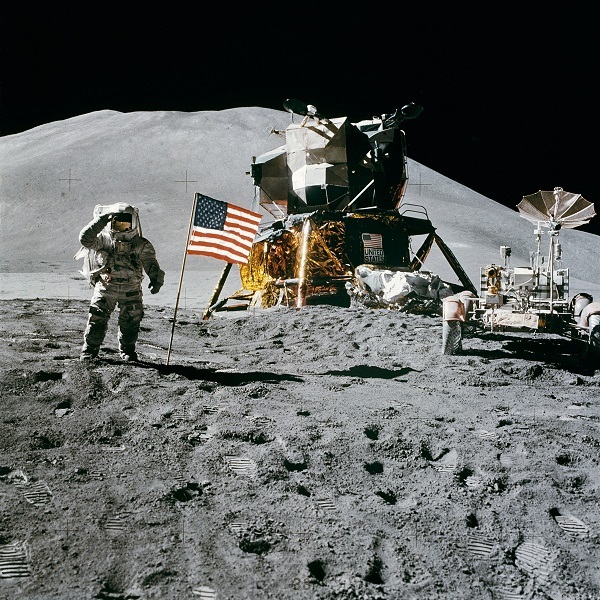 You know the famous photo of the American flag proudly planted on the moon’s surface? It’s still there, but it’s no longer standing proudly upright. Neil Armstrong and Buzz Aldrin planted it a little too close to the Lunar Module, so when they blasted off to head back to the main ship, the flag was blown away. Apollo 11 splashed down just south of Hawaii and the crew was collected by a US Navy ship, which couriered them to Hawaii where – despite the fact that most of the world had just watched them walking on the moon – they had to complete customs declarations with their ‘Port of departure’, Astronotes writes. #7 We’re going back to the moon – for good! Earlier this month NASA dropped an epic trailer video to announce that the space agency is planning to launch a mission to moon for the first time in nearly 50 years – and this time, they’re planning to build an actual manned moon base for launching missions to Mars and further afield. Cue all your James Bond Moonraker fantasies right now.